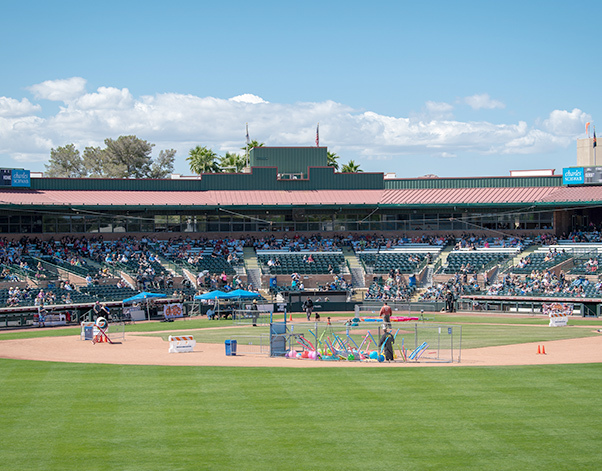 The 2019 Desert Dog Trails were held April 4-7 at Scottsdale Stadium, Scottsdale, Ariz. 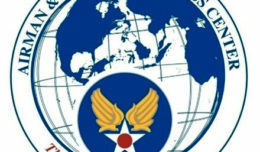 The trials which tested military working dogs and their handlers in a series of events. 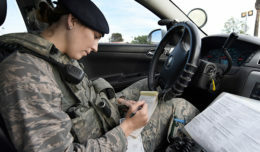 Participants included officers from local police stations, corrections offices, sheriff’s offices and the 56th Security Forces Squadron. 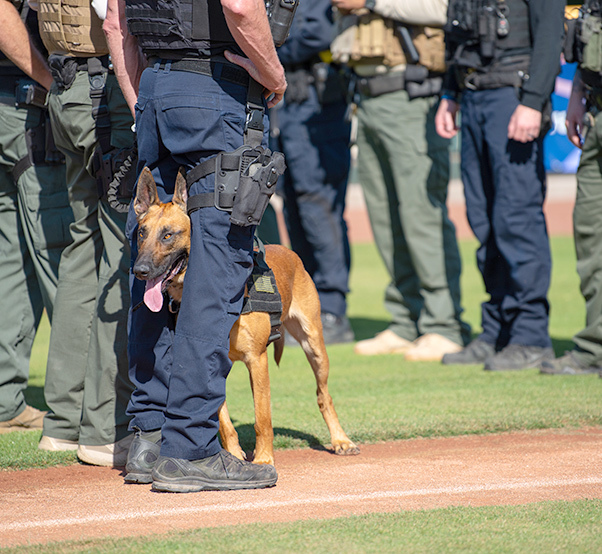 A working dog with a local police department peeks its head through its handler’s legs, April 6, 2019 at Scottsdale Stadium, Scottsdale, Ariz. As a kick-off to the 2019 Desert Dog Trials, all the handlers competing stood in formation during opening ceremonies. 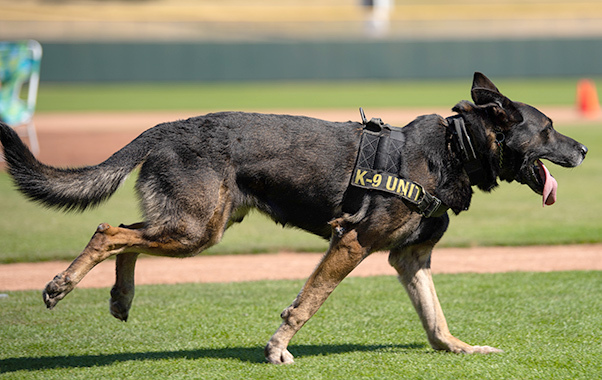 Rango, a military working dog assigned to the 56th Security Forces Squadron, sprints towards his handler during the 2019 Desert Dog Trials, April 6, at Scottsdale Stadium, Scottsdale, Ariz. Teams ran a course with obstacles including running and jumping through a tunnel, attacking decoys and scaling a six-foot wall. 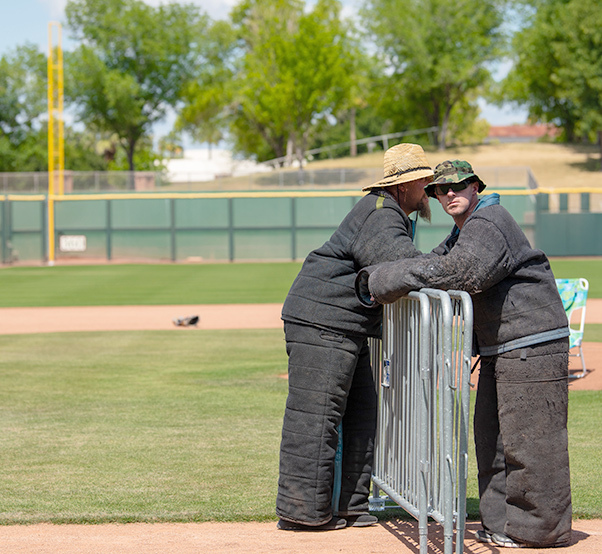 Police officers take a break during the 2019 Desert Dog Trials, as they wait for the next participant enter the field, April, 6, at Scottsdale Stadium, Scottsdale, Ariz. Decoys wear bite suits to protect themselves from the dogs strong bite. 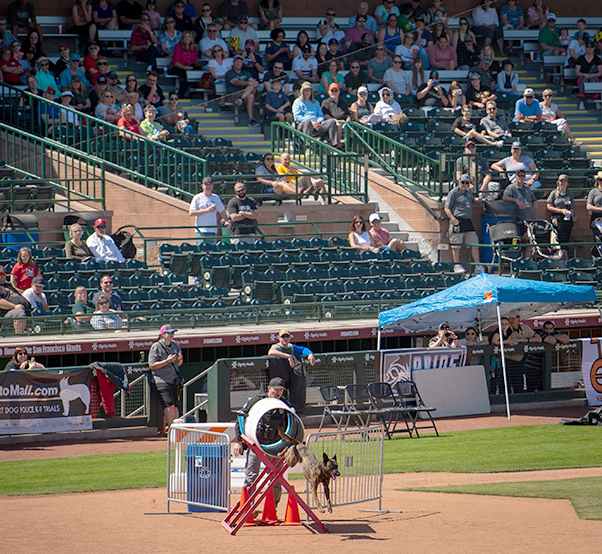 Spectators watch as a working dog and its handler work through an obstacle at the 2019 Desert Dog Trials, April, 6, at Scottsdale Stadium, Scottsdale, Ariz. The Desert Dog Trials have been hosted in the community for more than 15 years and test the teamwork and communication between handlers and the working dogs. 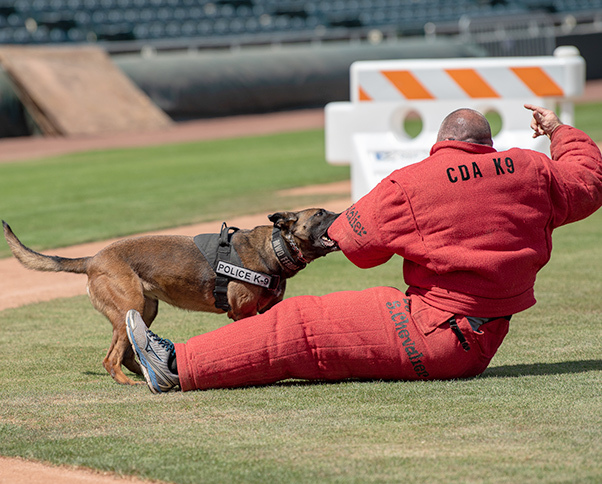 Frida, a Military Working Dog assigned to the 56th Security Forces Squadron, takes down a decoy in the 2019 Desert Dog Trials, April, 6, at Scottsdale Stadium, Scottsdale, Ariz. During the three-day event teams competed in multiple courses, including handler protection, building searches, agility obstacles, and a narcotics detection. Staff Sgt. 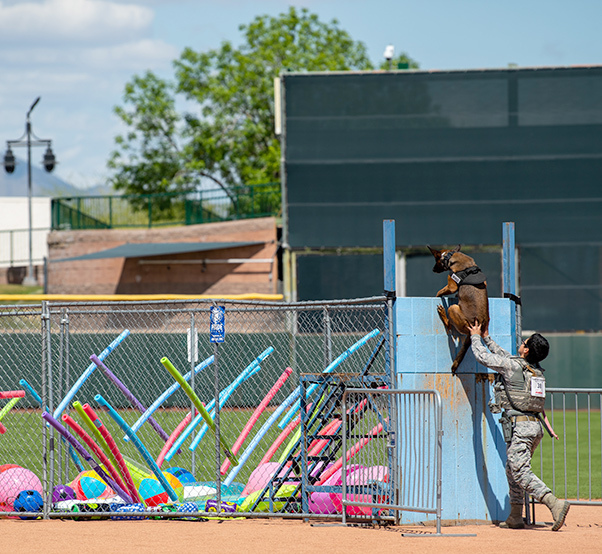 Elizabeth Pedroza, 56th Security Forces Squadron military working dog handler, pushes Frida, her MWD, over a six-foot wall during the 2019 Desert Dog Trials, April 6, at Scottsdale Stadium, Scottsdale, Ariz. As part of the course, Frida needed to scale the wall and attack the decoy on the other side while being distracted by all the toys in the pit. Staff Sgt. 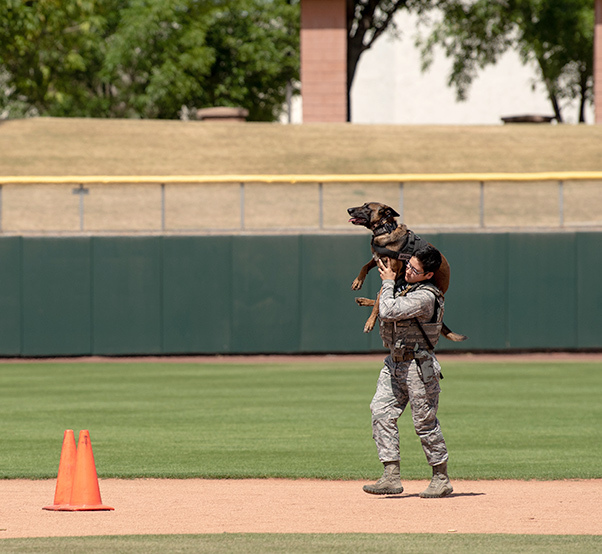 Elizabeth Pedroza, 56th Security Forces Squadron military working dog handler, carries Frida, her MWD, April 6, 2019, at Scottsdale Stadium, Scottsdale, Ariz. Pedroza and Frida were one of two teams from Luke Air Force Base that participated in the 2019 Desert Dog Trials. 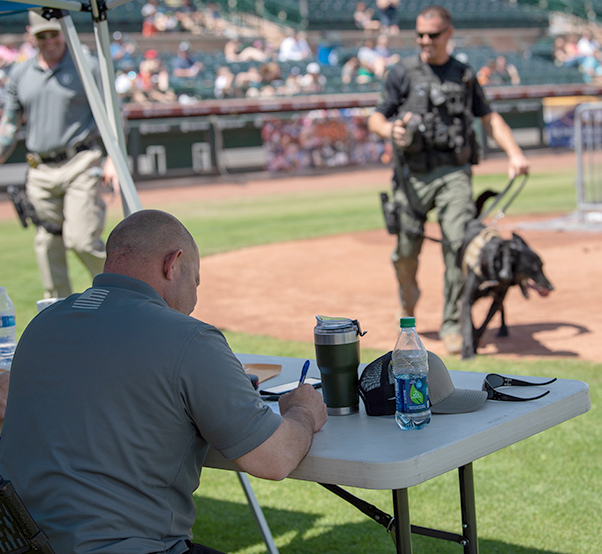 A panel of judges totals up a team’s points after their run at the 2019 Desert Dog Trials, April 6, at Scottsdale Stadium, Scottsdale, Ariz. 53 teams participated in the three-day event, after which the points were tallied and winners announced the 56th Security Forces Squadron team of Staff Sgt. Cameron Mcfadden and Rango earned 1st place in narcotics detection.